What is holding you back from working from home? Getting started working from home can seem like a daunting task. My story is not so unusual in that my current work-from-home career as a freelance writer and editor kind of just happened. Nine years ago, when I was pregnant with my first child, I was working as managing editor for a large trade association in Washington, D.C. Two months before the baby’s due date, my husband got laid off his job, which we had been expecting. Instead of my quitting like we had originally planned, I officially took maternity leave, not knowing if the generous 16-weeks leave would be enough time for my husband to find another job. During my time away from the office, the association asked if I could work from home on a few projects. With hubby still out of work, I agreed. Thankfully, my husband started a full-time job with benefits before my leave time expired and I was able to segue from a full-time employee to a contract, at-home worker. Today, four kids and nine years later, I love working from home and have no desire to go back to an office environment. I’m constantly grateful for the work that I have on a fairly regular basis, but know that not every woman can so easily find at-home work. 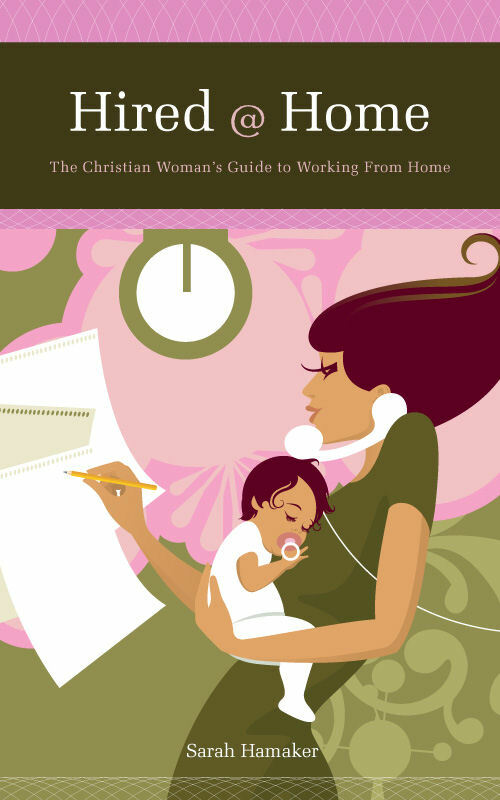 That’s why I wrote Hired@Home: The Christian Woman’s Guide to Working From Home. 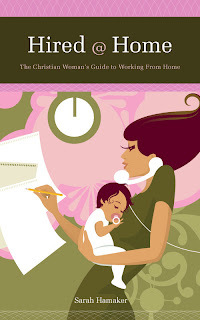 The book details how to think about work and gives tips and suggestions on what at-home work to pursue. Sprinkled throughout the book are the testimonies of more than 50 women who work from home in a variety of professions, jobs and businesses. This summer, I converted and updated the book into ebook format for Kindle and Smashwords. I will be giving away one ebook or PDF copy this week to readers who answer one of the following questions in the comments section of this blog. Your answers might be used in an upcoming issue of my free, monthly e-newsletter (to sign up, visit my website at http://www.sarahhamaker.com/). If you currently work from home, what held you back from starting sooner? I think what held me back from starting sooner was lack of imagination. Without thinking, I just didn’t like the sound of doing any of the few things I knew you could do staying at home after I ruled those out and didn’t go to the next step of brainstorming something else. Since my work-at-home status is come and go (whenever the creative bug bites me or “free” time presents itself)I struggle most with scheduling and finding that balance between housework and business work.